Description: Frostlichen is a thick-furred she-cat. Her legs are long and supple and her body is lean and small, though her incredibly long pelt hides this a bit. She is agile and graceful with her movements. 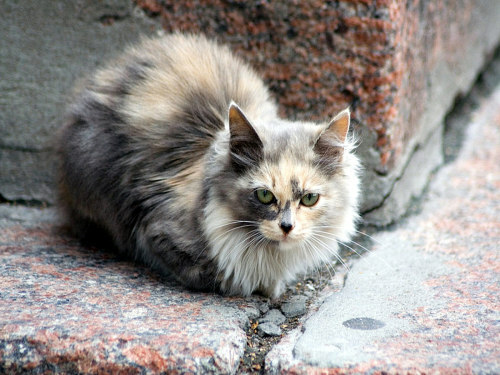 Her fur is a very light-hued tortoiseshell or calico variation, with little or no dark colors. It mottles white, browns, and tans as the majority. Her stomach and inner legs are white, as is her muzzle. Her fur transitions smoothly between colors, a collage of pale hues. It is quite pretty to look at, and coupled with her fluffy, lithe complexion, Frostlichen is quite a stunning she-cat. Her faults are few, but she does have them. Her front left paw is slightly deformed, her right-most toes are melded oddly together. Despite this fact, it is hard to notice and usually no cat says anything bad about it. To lead back to her more delightful aspects, Frostlichen's nose is a soft pink-gray, as are her pawpads. She has long, thin whiskers and wide rounded ears. Frostlichen's eyes are a vivid green, hinted with turquoise-ish blue. Personality: Frostlichen is an all-around sweet cat. She is gentle, kind, caring, and helpful to any in need. She is the definition of loving. She can melt almost anyone's heart, and can make even the most fearful and angry cats calm down. She is grace and goodwill, formed as a cat. Of course, her kindness leads her to be slightly sensitive and almost defensive at times. She is somewhat nervous actually, and can be jumpy around things that worry her. She is very protective though, and along with her sweetness she is a fierce defender of her companions. Nothing stands in her way when she goes into one of her protective rages. And this is somewhat odd--she has a rather short temper especially with obnoxious and arrogant cats, and ones that wish to do harm. She would willingly lay down her life for others, as long as they were safe. This leads her to make deals just to keep her friends happy, but she would rather jump into a bed of thorns than let her family and loved ones be hurt. She knows she can't always be there to protect, but will as much as she can. She is extremely self-less in this way. Frostlichen is very patient as well, yet she understands that she does not have all the time in the world and wishes to live while she can. She is obedient to, a loyal warrior in her Clan. She has a fierce, somewhat irrational hatred for non-Clan cats. She doesn't know why, but it helps fuel her anger for the Strangers. She makes exceptions for cats that are hurt or very young ones. Frostlichen is also a careful cat, and she always helps her Clan in a way that is overall beneficial. For example, she tries to catch larger and more filling prey than smaller, weaker ones that she shouldn't waste her energy on. History: Born to loving parents, Fadedleaf and Owlstalk. She had two brothers, larger tom-kits of the names Thistlekit and Aspenkit. Frostkit was a gentle sweetheart from the start, usually soothing fights and being ever-obedient. As she neared apprentice age, she found herself doting on her friend, Smokekit. Known as Frostpaw moons later, she became a vigilant and loyal apprentice. She quickly found her love in Smokepaw, and that strengthened as she earned her warrior name, Frostlichen. Though, she readily agreed to have their affections secretive, being nervous about them. 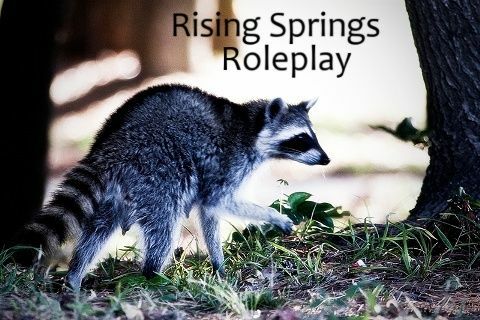 Now a caring queen, she devotes all her love to her kits and still her mate, and awaits the day that Smokestar is known to them as their father--and to the rest of the Clan.